To ask one question that will lead to the joining of two souls, make the setting as memorable as the journey to follow. Hop to a secluded cove by speedboat and get down on one knee to ask the question. Hide the ring amongst the coral reefs with colourful fish as your witness. Your dream’s the limit when it comes to crafting a perfect surprise proposal. The private island setting of Batu Batu, with its crystal clear water, paradise beaches of fine sand and dramatic granite rocks, paints a spectacular backdrop for an intimate wedding or a dream honeymoon at the end of the world. From pre-wedding couples’ spa treatments and cocktail receptions to a private beach wedding and post-wedding brunch, every small detail of the celebration can be customised to romantic perfection. Succumb to the wild beauty and lush nature of the island to celebrate your wedding feet in the water on one of the most beautiful beaches in the world. Hard to imagine a more beautiful place for future brides and grooms than the private island of Batu Batu, its crystal clear water, its paradisiac beaches of fine sand: a unique setting, contrasting granite rocks bordering the beaches. This Malaysian paradise island south of the Gulf of Thailand, very close to Singapore, offers a mild climate, long white beaches of fine sand, turquoise waters and magnificent sunsets. A destination full of purity between sea turtles and coconut trees, with undeniable charm, it is a magical place to celebrate weddings. This idyllic island is a dream destination and makes many dream. Yet with BatuBatu, celebrating her wedding on the beach in Malaysia is a more accessible dream than it seems. With its wildly beautiful white sandy beaches, the Malay islands are a real paradise where romance, exoticism and serenity are the watchwords. It is one of the most popular destinations for young couples looking for a romantic wedding or a dream honeymoon to the end of the world. This destination is not only the romantic destination par excellence, it is also a true garden of Eden where the fauna and flora, unique in the world and its many protected species will offer you a guaranteed change of scenery. 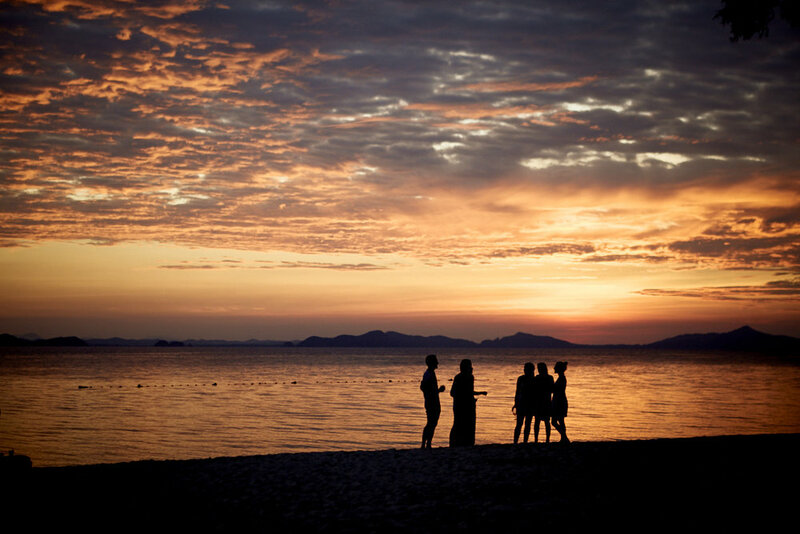 Why host a wedding on a private island in Malaysia? Barefoot Luxury - BatuBatu will offer you a warm welcome and privileged services. Your stay on this private island will remain engraved forever. Relaxation and well-being - massages in love, cocooning bare feet or relaxation at the beach, your hosts will be with the small care to make you live a magic and relaxing experience. Sport and discovery - For the most adventurous or the most curious among you, we advise you to participate in all the activities proposed on the island. Stand Up paddle, Scuba diving, catamaran, you will certainly find your happiness! Ecology and nature - This dream destination is also full of nature reserves, beautiful beaches and coves to explore and unique protected sites in the world. You will live an experience in perfect harmony with nature and respect for the environment. It all depends on when you are on the island, but it is possible to see the turtle eggs hatch, as well as the release of baby turtles to the sea. It is hard not to be seduced by this Beach Resort in Malaysia. Thanks to the beauty of its natural environment, its heavenly beaches and mild weather all year round, this destination is ideal for future spouses and will be perfect for a dream wedding. This destination will host your wedding ceremony, whether it is a secular ceremony or a religious wedding, with the utmost respect for your privacy. How does a wedding take place at the best beach resort in Malaysia? The wedding ceremony will take place on the beach, directly in the sand and away from the swimmers. You will seal your union in the most romantic way you can imagine, by the water in a dream setting. It is recommended to do the ceremony in the morning or late afternoon depending on the location. The day will begin with the preparation of the bride which will take place in her room with beauty if she wishes. A boat with driver will drive the bride and groom on the decorated beach where the officiant and the photographer will welcome you, as well as all the loved ones present. The master of ceremony will read the wedding texts then you will exchange your wedding rings and you will sign your marriage certificate always on the beach. At the end of the ceremony, you will drink with Champagne to celebrate your union. A photo session will be organised on the beach, to immortalise the most beautiful emotions of your wedding. At sunset, you can opt for a candlelit dinner on the beach or in the comfort of your villa. If the idea of getting married on a paradise island in Malaysia, we take care of organising your wedding! Send a message to our team and they will be able to help you to organise the wedding of your dream. We do have a few terms and condition for hosting an event on the island, please find them here. Get in touch with us to discuss the idea of your big day. Our team will get back to you very soon.